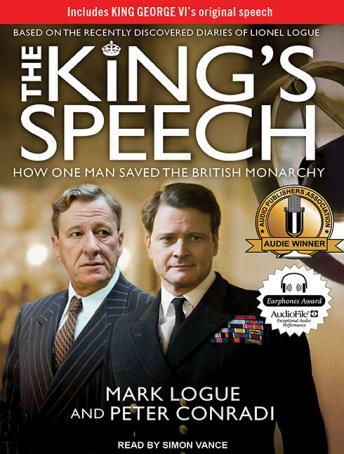 The King's Speech was written by London Sunday Times journalist Peter Conradi and Mark Logue-grandson of Lionel Logue, whose recently discovered diaries and correspondence contain fascinating details about these true events. At the urging of his wife, Elizabeth, the Duke of York (known to the royal family as 'Bertie') began to see speech therapist Lionel Logue in a desperate bid to cure his lifelong stammer. Little did the two men know that this unlikely friendship-between a future monarch and a commoner born in Australia-would ultimately save the House of Windsor from collapse. Through intense locution and breathing lessons, the amiable Logue gave the shy young Duke the skills and the confidence to stand and deliver before a crowd. And when his elder brother, Edward VIII, abdicated the throne to marry for love, Bertie was able to assume the reins of power as King George VI-just in time to help steer the nation through the dark waters of the Second World War. A great story while finishing one war and beginning another, the speech brought a nation together if a stammer in the new King could be solved. um oops, I think I learned something while I was enjoying this book. There were several things that I wondered where the known facts stopped and the generated for stories sake facts began. I did enjoy this story.